Our pressure sensitive adhesive (PSA) sanding discs are made with industrial grade stearated aluminum oxide paper. Engineered for top performance with all popular tools. Available in a wide selection of grits in both 5" and 6" diameters. Discs with vacuum holes can be special ordered in box or case quantities. Each disc has a parting sheet to keep the adhesive fresh. The discs on this page are aluminum oxide for use on wood or automotive. 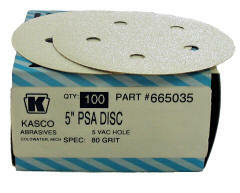 Click here for 5" W/D silicon carbide discs for use on granite and marble like materials. Some 6" grits are special order and can take 1-2 weeks to ship. Download a printable 6 page catalog of our paper sanding discs. Go to shopping cart list for PSA paper discs. For box pricing For case pricing.